On Sunday, October 15, I attended what was announced as the Final Reunion of the Pasadena Playhouse Alumni Association. The 62nd. Yes, I’m an alumna. Of course, I showed up. I confess I did not always show up. During the organization’s heyday, when we were young, actively engaged in life and participatory, I attended these events — occasionally. Years ago, when one of my former classmates — let’s call him FC — became president of the Alumni Association, I attended out of class loyalty. FC had managed by then to snag a top management position with a nationally important theatrical enterprise and, to my shock, had transferred that importance to himself, going from slender and fun to corpulent and preening and, in the resulting transformation, had become a monumental bore. I swore off attending for a number of years after that. But a FINAL reunion? How could that be… and how could I resist? It was time to catch up. Our numbers were shrinking. I had loved my years at The Playhouse. Besides, this year is also The Playhouse’s centennial. One hundred years. Not many organizations, good or bad, survive that long. And very few, if any, are as seminal as this one had turned out to be, in spite of horrendous ups and downs following the death of the founding Artistic Director, Gilmor Brown. What had started as a little community playhouse on Fair Oaks Avenue in 1917, became The State Theatre of California in handsome new digs at 39 S. El Molino Avenue 20 years later. It remains at that address as one of the earliest models in the development of the nation’s regional theatre movement. Brown had many of the right ideas from the start, even if he was not always able to fully implement them, but he never gave up. He started one of the first schools of theatre in the country, perhaps as a way of affording to produce his mainstage plays, and what the school lacked in theoretical instruction and intellectual challenge, it more than made up for in day-to-day practical application of this collaborative art. We, the students, were given opportunity after opportunity to perform, direct, design, stage-manage, initiate and invent as we went along. We were taught to use not only our bodies (plenty of fencing and dance instruction) but also to use our heads. Be creative. Find ways around what might be lacking, materially or even imaginatively. Be resourceful. We were taught to project, to speak clearly and well — almost a lost art today, judging by the armies of overmiked actors who think they’re allowed to whisper on stage. Along with the good scripts, we were sometimes given terrible ones for our student productions because, as Mr. Brown told me one day when I had the audacity to question his choices, “you can learn as much from being in a bad play as a good one,” although he failed to mention that it also may have had a little something to do with sparing the school from higher royalties. On the whole, he wasn’t wrong. This teaching/learning by a mix of instruction and apprenticeship was invaluable. Our teachers were knowledgeable. The chance of being an extra in a mainstage production or having a small part in one (sometimes a big part in one), was pure gold — far more useful in the real world than guru genuflection and hocus pocus about “being in the moment.” Shakespeare’s time spent with the Lord Chamberlain’s company of players (later the King’s Men) was not wasted on theorizing. Neither was Molière’s, whose ragtag actors performed before cabbages and kings. 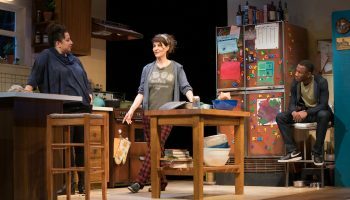 When I emigrated from the deserts of Alexandria, Egypt, I was directed to — No, I was told, with passionate insistence, that I had to go to The Pasadena Playhouse by a friend of a friend. Pasa — what…? This vibrant young Egyptian man had just returned to his native country from two years honing his skills at The Pasadena Playhouse. He had loved The Playhouse and was determined to become a top filmmaker in his country, where no professional theatre existed and a primitive film industry hobbled along playing strictly for a narrow market of Arab-speaking countries. Youssef Chahine made good on his promise. Right out of the gate, he won an award at a Venice Biennial with Ebn El Nil (Son of the Nile), his first film, inspired by an idea he had stumbled upon in playwriting class at The Playhouse. Chahine became that rarity: an award-winning Egyptian filmmaker, where no such creature had ever existed. We remained friends and, aside from his considerable body of work, he left behind plenty of memories with his Playhouse teachers, where his reputation took on new life with the emergence of each one of his subsequent films. They were not well-known in the US, but they were huge in the Middle East. 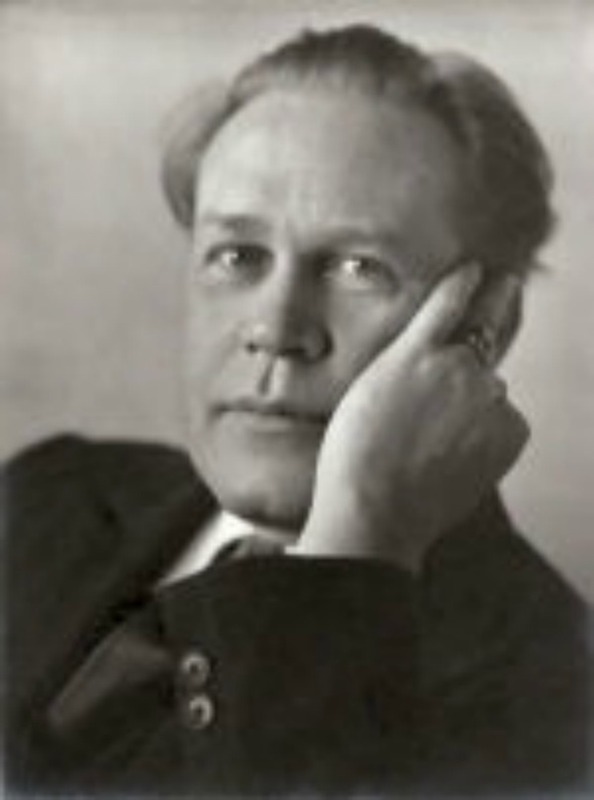 When Gilmor Brown passed away in 1960, his death had been anticipated. The Playhouse had been bait for circling vultures for some time. During Brown’s waning years, the theatre and the school had started drifting. The saddest day came when a sale of the theatre and its contents at auction took place under a rainy sky, when the roof leaked above the stage and I, a rookie reporter at the Los Angeles Times, was assigned to write the story and wipe the tears, if not the floor. This event was followed by years of seemingly insurmountable woes. Bankruptcies. Attempted rescues by the city, by the board, by new owners, new regimes. Some better than others. Some a lot worse. Talk about mood swings! 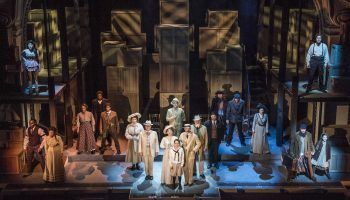 As a theatre columnist at the paper, a good deal of my time was spent writing about those swings — enough to get heartily sick of all the complicated ramifications and the endlessly unfolding tribulations. But: with a lot of help from friends and supporters — I’m condensing here — The Playhouse survived. And this year is its centennial year. At the urging of some fellow alumni and a particular Playhouse supporter whose unfailing enthusiasm and winning personality have made her a Playhouse treasure, I joined an effort to get the city, the state and even the East Coast to recognize the event and this theatre’s historic struggle. We succeeded locally, here and there. Nationally? No, despite the effort. 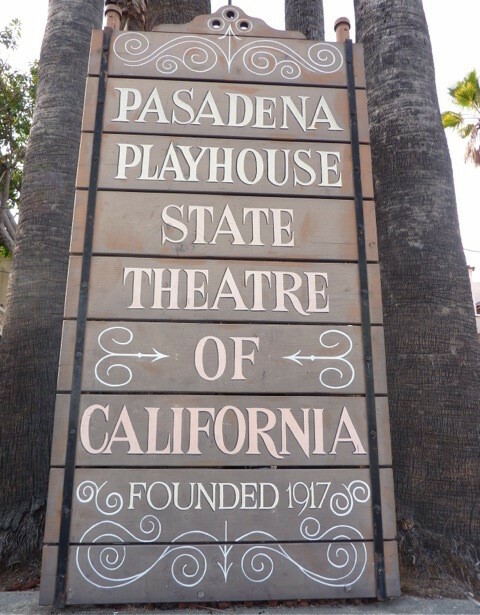 But… The Pasadena Playhouse was and is no less an anchor and a pioneer for that omission — and its centennial is not over yet. 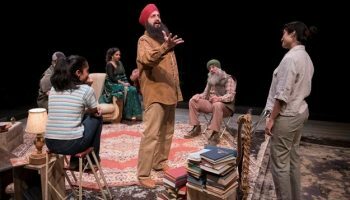 A hundred years of survival, through thick and thin (mostly thin), even with an interrupted trajectory as a producing regional theatre, merits attention. It should be paid. Fountain in the Playhouse Patio. Artwork by Peggy Ebright. Beginning in 1997 and until last year, Sheldon Epps served as the next-to-latest in the string of Artistic Directors. During his tenure, he battled financial shortfalls and introduced substantial diversity into the theatre’s mainstage seasons, which resulted in his having a checkered but beneficial impact on Playhouse programming. That difficult success went some distance to restoring the role played by this theatre within the community, and throughout those years, The Playhouse managed to maintain a healthy presence within the life of the performing arts in the broader Los Angeles. 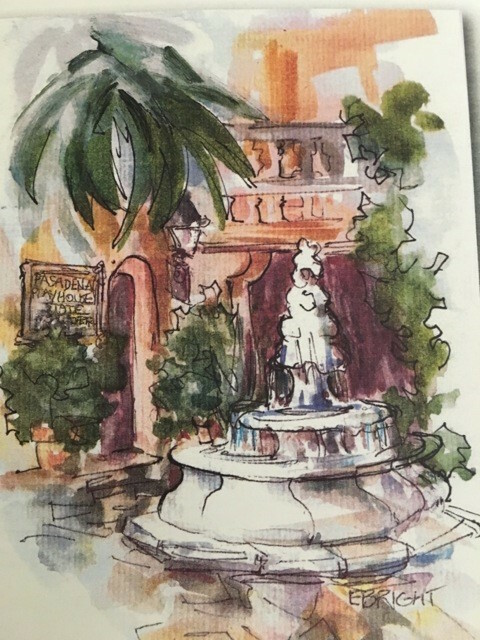 Over time, The Playhouse persisted chiefly because of supporters who wouldn’t give up and could not bear to see it vanish, including the City of Pasadena, which recognized the theatre’s larger significance and marshaled resources to come to its rescue at critical junctures. These actions opened and sustained a tortuous path to recovery, until The Playhouse found its way to make a serious comeback as a producer of professionally mounted plays and musicals. But the struggle is not over. Now that he’s ceded the reins, Epps retains the title of Artistic Director Emeritus, while his replacement as The Playhouse’s Executive Artistic Director is Danny Feldman, formerly Managing Director/Executive Director of New York’s Labyrinth Theater Company, a cradle of diversity and new work. Feldman attended the reunion Sunday and presented a candid and energetic picture of both the challenges it still faces and his hopes for its future. Time will tell, there is no question that the challenges are large, but Feldman’s vigor, youth and willingness to listen augur well. And after a million-dollar building-renovation gift from Sacramento in hnor of its centennial, that beautiful California hacienda-style theatre at 39 So. El Molino Avenue has never looked better. Am I partial? Of course. As with all theatres and theatre schools, anecdotes abound and echo in the rafters. 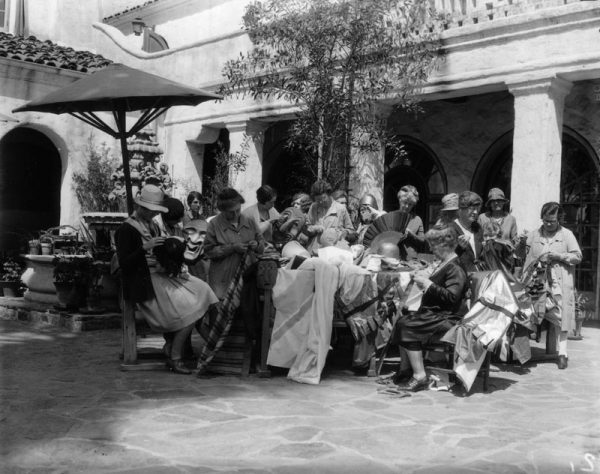 The roster of stage and film performers, directors and producers who have worked on Playhouse stages at various times (some of whom also trained there, before the theatre school was forced to shutter in 1969) includes the names of Sylvia Sydney, Tyrone Power, Robert Preston, Florence Bates, Mabel Albertson, Dana Andrews, Victor Jory, Jean Inness, Leonard Freeman (creator of “Hawaii Five-O”), Leonard Nimoy, Earl Holliman, Dustin Hoffman, Elaine May, Marion Ross, Raymond Burr, Gene Hackman, Eleanor Parker, Kim Hunter, Rue McLanahan, Jamie Farr, Charles Bronson, JoAnne Worley, Harry Dean Stanton and that tireless proselytizer, Youssef Chahine. Among others. 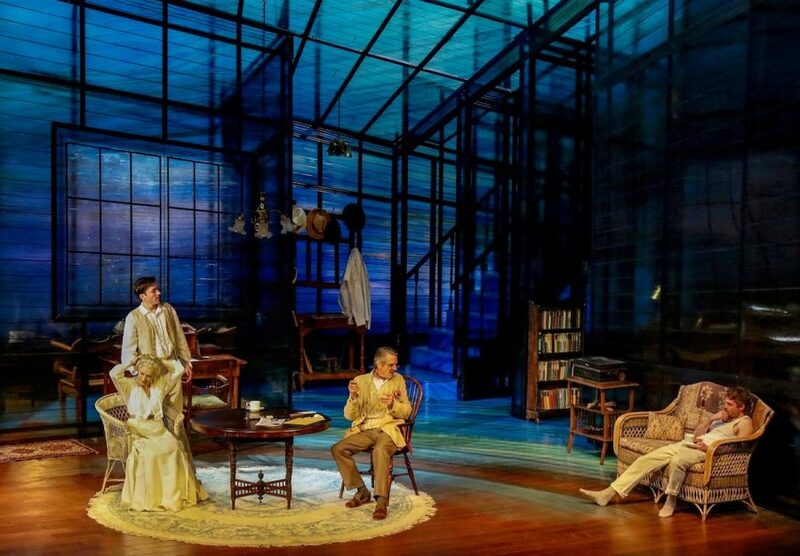 In 1928, with Victor Jory in the lead, The Playhouse mounted the first of the only two stagings of Eugene O’Neill’s Lazarus Laughed (the first in Pasadena, the second at Fordham U. in New York). It was a flawed but wildly ambitious play and production, requiring a cast of 136, and ultimately decried as “tedious” and “unactable.” It did, however, manage to gross $35,000 (a tidy sum in its day) and attract worldwide attention, thanks to the notoriety of the playwright and the sheer magnitude of the undertaking. In 1924, under the Playhouse aegis, Gilmor Brown originated the earliest American theatre-in-the-round in a converted living room just up the street from the Playhouse and aptly called it The Playbox. It’s what it was. His Playbox. Retired Cal State Long Beach Professor Gail Shoup, has written a comprehensive history of The Playhouse, with a wealth of additional detail, that is archived at UCLA and at The Playhouse. Over its hundred years, The Playhouse also has managed to maintain its own uncommonly complete archives that reach deep into its history. These are reportedly being processed by the Playhouse and the neighboring Huntington Library and may prove to be the most complete and extensive archival material of any professional American regional theatre. Finally, in a conversation with Louis Mertins, a Robert Frost biographer (Robert Frost: Life and Talks-Walking), Frost spoke about his family’s relationship with The Playhouse at the time when he was living in Monrovia, California, in the summer of 1932. Only the italics are mine. As for final reunions, that door remains ajar. This one was so much fun that we were given to understand that maybe, perhaps, like so many farewell tours, another one might, well, be possible. Top image: Pasadena Playhouse Entrance. Artwork by Peggy Ebright. From another Playhouse Alumna – So happy to see this homage to our beloved Playhouse! A welcome reminder of so many happy days as a student, then later trodding that hallowed stage. Thanks, Sylvie! A heartfelt thanks to all of you who have taken the time to comment. Ourr days in that lovely place were halcyon — and we were so young and full of P & V! Sylvie, Thank You for such a lovely, heartfelt Valentine to the place that holds so many great memories to those of us who have had the opportunity to share in that history over the years. Oh, Sylvie! As always, you have put a spotlight on ‘our’ Playhouse as only an alumna can. This alumna of the last graduating class, 1969, is VERY grateful.